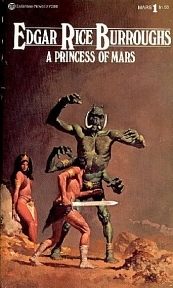 I recently acquired Edgar Rice Burroughs‘ Mars Novels – the 8th printing with covers by Gino D’Achille. The first novel, A Princess of Mars, was originally published under the title Under the Moon of Mars by Norman Baen (pseudonym) in All-Story Magazine as a six-part serial, February through July, 1912. What stuck me was the size of these books. They are uniformly between 150 and 200 pages in length – what some might call “short stories” compared to the current crop of sci-fi / fantasy works on the market. They’re wonderful! There is a place for the Brooks and Goodkinds, but I’m drawn to the works of authors who can captivate me in short order, spinning a tale that doesn’t require numerous hours of my time to enjoy. This entry was posted on Friday, March 16th, 2007 at 07:03 and is filed under Featured. You can follow any responses to this entry through the RSS 2.0 feed. You can leave a response, or trackback from your own site.